In our life, we need someone whom we can love, trust, confess our mistakes, and ultimately surrender in times of need. We want someone powerful who knows everything about us, understands us, sympathizes with our problems and also knows how to correct us. What we truly need is a ‘personal’ God, one to whom we can say ‘You are mine!’ We want that God who is not just the giver of fruits-of-action, but the one who can favor us and accept us as we are. The trouble with our life is that Bhagwan is most important for us but we feel that He is the least important. We need Lord all 24 hours of the day, therefore we should not confine Him only to our Puja rooms. Let us learn to change our mind to ‘Bhagwan mode’ from ‘noise mode’. Let us take a dip in Ram leela. Let us make our hearts ‘Ayodhya’. Ayodhya means having no battle in the heart. Anything can happen in our life by Lord’s grace. He is capable of giving whatever we miss in life. He is capable of taking away all our weaknesses and regrets. We can ask Him anything we want. If we want to talk to Him, He talks with us. If we want to offer Him something, He accepts it. If we want to cry in front of Him, He sympathizes with us. If we want to be angry, He pacifies too. We have so much need for God in our life. At times, we don’t understand how to deal with our mind or how to deal with others or how to deal with various relations of this world. But the moment we bring Bhagwan in our heart, our mind becomes calm. All problems of our life, be it emotional, social, physical, financial or spiritual, is solved by Bhagwan when we bring Him in. He is the biggest need of our life! It is said in Ramcharitmanas that Bhagwan Ram used to take bath in the Ganges every day and then perform Shivji’s puja. Bhagwan Ram’s routine demonstrates how we should have a ‘puja session’ every day. Just like a small child needs a mother and father, or like a poor country needs a richer country, or as a less knowledgeable person needs a more knowledgeable teacher, similarly the powerless jeeva needs the all-powerful Ishwar. We are all physically, emotionally and intellectually powerless. We need Bhagwan a lot and what connects us to Him is ‘Puja’. If that connection is made with the Lord, we will also feel powerful because of His power. We should not think that puja is a mere ritual where we just perform actions such as offering flowers, fruits etc. It is an opportunity to assert our proximity to the Lord. We, who are a “Part”, get the opportunity to realize that we belong to the Lord, who is the “Whole”. Bhagwan is our biggest support and He alone is our friend. We just need to invoke Him and then alone we can be happy. The world keeps telling us, ‘Don’t depend on me, don’t come close to me, you will get shocks.’ Outer situations tell us how much more we need God and how less we are invoking Him. Every situation tells that if we would have had more faith in Lord, if we would have called the Lord and if we would have had the confidence in Lord, then we would have been a happier person. Puja, japa, sadhna all are the connectors to Bhagwan. Without Him, we are all orphans. Tulsidasji says in Ramcharitmanas that Nishadraj prayed to Bhagwan Ram saying, “I will show you the path, and then for few days I will be there with you, I will make a nice cottage for you, then whatever you say I will do, if you say go I will go back.” This is the wish of every servant, to be with his master, to serve him, to love him, to give his best, to feed him, give him water, to prepare bed for him, to wash utensils for him and so on. Bhagwan asked Nishadraj, “What do you want?” Nishadraj in return said he wanted only Bhagwan’s happiness. More is the selflessness in love, more is its purity. Nishadraj only wanted to give joy to the Lord. The spirit and bhaav of seva is that even if we have to go through a lot of pains, and troubles and tribulations to give joy to our beloved, we go through everything willingly. This is the bhaav which makes Bhagwan happy. When the Lord asked Nishadraj to go back home, his face became dry and pale. Fortunate are those who have such state of mind. We cannot leave one good person in our life who is sweet, humble, gentle, caring and loving, what can be said about the Lord who is the epitome of all these virtues! “Teerth” means ‘Taranti anena iti teerth’, through which you cross or through which Bhagwan expresses. Sins get washed away and desires get fulfilled in a Teerth. Teerth is not a place where saints live. The places where saints live, those places alone become the Teerth. Saints are the moving confluence, they are moving Ganga, Jamuna and Saraswati. Bhagwan Ram, in order to glorify the teerth went to Prayagraj (teerthraj). Like you don’t tell about yourself to everybody, similarly Teerth also keep their secret hidden. Unless the teerth tells its glory, we won’t know it. Such is the mahima (glory) of a Teerth! Bhagawan Ram, during His time of exile, visited various pilgrimages and went to the ashram of various great saints. Bhagwan gave a message to all of us that we should also visit pilgrimages and go to saints and sit at their feet. When we live with saints, their merits and punyas come to us and we become more enriched in our experience. Saints tell us about so many things that we are ignorant about, such as how to do puja, how to meditate, how to remain joyful etc. Like upon seeing a disturbed person, our mind becomes disturbed, seeing a crying person, we feel like crying, similarly seeing a saint who is quiet, we will also feel quiet. When we see a saint, we wonder that how can someone who has no bank balance, no relatives, no money, can be so much balanced and can have so much quietness and joy in him. Even if one doesn’t attend any discourses, simply by visiting a saint, one will be happy. From the body of the saints, so much quietness radiates, that it makes you calm. A saint alone makes another saint! By going to pilgrimages too, we learn a lot. The very first thing that we realize is that even after a lot of planning, it is only Lord’s planning that works. No matter how much money or resources we have, it is only as per Lord’s wish that we would have His darshan in the teerth. When we worship our individual God in home, our faith is small, but when we go to some teerth like Vaishnavi Devi, Kedarnath, Badrinath etc., then we see hundreds of people walking and chanting Lord’s name, then our faith gets restored. Pilgrimages are physical expression of God and His love for the devotees. 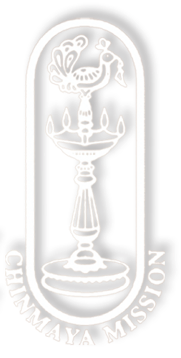 There are numerous teerths in India. For instance, there is a place in Rameshwaram named as ‘Gandh madhav parvat’ where it is said that Hanumanji took a leap to cross the ocean. Similarly, there is another place called as ‘Dhanushkoti’ where Bhagwan Ram put His bow and the bridge to Lanka was made. There is a place called ‘Triyug Narayan’ where Vaman Bhagavan took Avatar and took the stride. The sacred Indian subcontinent is blessed with many such teerth! There is a special kind of vibration and healing at every teerth, and by visiting those places, the devata of the teerth blesses us immensely. It is said that Bhagwan Ram, upon visiting Bharadwaj rishi, offered dandavat pranaam (lying prostrations) to the great saint. Here, the Ishwar did prostrations to a jeeva. ‘Pranaam’ is not offered to the body, but to the tapasya (austerities) that someone has done. Every emotion has a corresponding language. The emotions that ‘you are great, you are very big, your austerity is greater than my austerity, your knowledge is greater than my knowledge,’ are expressed through prostrations. Bhagwan Ram is setting the rules for us. Even Bhagwan Krishna used to offer pranaams to Devaki and Vasudevji by touching His head on their feet. Such is the glory of offering pranaams and such is the richness of our culture! When Bhagwan Ram went to the ashram of Bharadwaj rishi, Bharadwaj ji was full of supreme joy. This is a very beautiful thing about the Lord that He himself goes to His devotees. When you are ready, God comes to you, Guru comes to you. You keep on doing good actions, and good things and good fruits will come to you. Some people have great desires. Bharadwaj rishi had the desire that one day Bhagwan should come and sit in his cottage. Shabri had the desire that Bhagwan should come and she should feed Him. As is your desire, so are the things that will come to you. Gopis were not merely cowherd women of that birth, they were great rishis of past births, who thought a lot that Bhagwan Krishna should come to their house and take food from their hands. Always think very high, always have a very big desire. Have the desire that during the last moments of our lives we must not have any attachments, we must remember only the Lord’s name and we must see only the Lord’s face and pass away. When we have bigger desires, they surely get fructified! While offering food to Ramji, Sitaji and Lakshmanji, Bharadwajji spoke to Lord Ram in a manner which took away Ramji’s tiredness. Most relaxing thing in the world is somebody’s loving words. One may have a good lounge, good bed, but good words relax a person better. Those whose hearts are beautiful, their words are also beautiful. Bharadwaj ji said that his life was fulfilled now. All his tapasya, austerity, pilgrimage, japa, sadhna etc. had borne the fruit and the Lord Himself was in front of him. Living with a good person we feel we have got everything, what to say if we are with God. 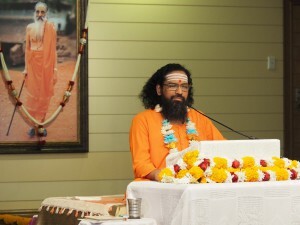 Sitting like a child in front of the Lord, Bharadwaj ji pleaded to the Lord to give him Bhakti. ‘Bhakti’ and ‘Myness with the Lord’ are very important. We must repeat in our hearts, ‘Oh Lord! Be happy with me. I am incomplete without You. I have nowhere to go. I have no one to talk to other than You. You alone are mine!’ Our Bhakti should be such that we must only want to please the Lord and love Him without logic. Such Ananya Bhakti (single-pointed devotion) must be developed! We should realise what should we seek most in our life. We think that money, power, family should be most sought-after, but it truly should be Lord’s love. Something should happen in our life that we start depending on the Lord and stop depending on the world. Loving the Lord means depending on the Lord, wanting the Lord, making the Lord feel that we want Him alone. Other than Lord, nothing is worth desiring for. Anything or any person you desired in this world, it became the cause of your pain, anguish and frustration. It is the love of the Lord alone that makes your life quiet. There was an old saintly lady, who was very sick and in a lot of pain. She used to chant, ‘Shri Krishnam samarpayami. Oh Bhagwan! Give me pain but You be happy with it. May my pain give you happiness. Let there is a lot of pain if it gives you happiness.’ This is called devotion. When love is there, even the stabbing from the beloved appears as a petal of rose. Your acceptability of the situations becomes very high. When Bhagwan Ram heard that Bharadwaj ji is asking for devotion, Bhagwan Ram got very happy seeing his bhaav. It is the bhaav alone that makes God happy. When you offer naivedya or flower, God enjoys the bhaav that how much thirsty you are to give Him joy. God enjoys His thirst in your heart. After staying at Bharadwaj Muni’s ashram, Lord Ram with a happy heart went to seek permission to leave and asked Bharadwaj ji very respectfully and humbly, “Which path shall I take?” Bhagwan Ram doesn’t need any particular path, He Himself is the goal. Here Bhagwan is acting like a human for us. We need the Lord both in the form of Ishwar as well as in the form of an Avatar Purush. If we consider Lord as the ‘all-powerful Ishwar’, one good thing happens is that we can get Shakti (power) from Him. When God is the sole strength of our lives, we become very strong. We need God as Ishwar because there are various things and situations in life which are out of our control. Ishwar in the form of human being (Avatar purush) gives us inspiration to live a righteous life. We need someone to show us how to live, how to talk, how to behave with others, how to respect our Guru and elders. Bhagwan Ram’s joyous acceptance of exile teaches us how to respond when such difficult and unexpected situations come in our life. It tells that no matter where we are placed, our joy should not come down. As happily we eat in a golden plate, so happily we should eat in our palm. Ramji’s question to Bharadwaj ji that “Which path shall I take?” implies that we too should go to saints and ask them, “What is my way out? Am I progressing towards some higher goal or only progressing towards the burial ground?” We should keep checking whether we are reaching closer to our goal or not and has our devotion increased or not. Our real goal is that we want to be peaceful, we want to be quieter, we want to be a devotee of the Lord and we want to do a lot of austerity. It is the saints alone who guide us towards our true goal of life. Best thing about human beings is that they aren’t satisfied with anything. Big house, nice car, nice clothes, everything gets boring after a few days. One who realizes that all the worldly things gives only fleeting and impermanent joy, he develops dispassion. Supporting Ramji in His demonstration, Bharadwaj Muni replied, “Ram! Every path is easy for you.” Bharadwaji ji sent four of his qualified disciples with Ramji to show Him the path. These four disciples are considered to be the 4 Vedas which tell us who is Bhagwan. Are we progressing in life? In our life, sometimes we find that we have progressed outside, we have got a better job, bigger house, more money, but inside we don’t know whether we have moved forward or moved backward or not moved at all. It is important, it is imperative that we should ask this question to ourselves – Is our life just a journey from womb to tomb or is there something more to be attained? There are two possibilities – you are moving on the right path or going round-about. If you are moving on the right path, the scenes change, there are meaningful milestones on the way. But if you are going round-about then you remain the same worry-full shallow person and even years later you are headed nowhere! Why have company of saints? An ordinary person doesn’t even have any inquiries about his life such as – Is there any target which I should complete before death? Should I attain quietness of mind? Should I attain self-realization? It is when we come in the company of saints then these inquiries arise in our mind and the saints tell us whether we are on the right path or not. One single wrong guidance can take a person to a very difficult situation and one right guidance can take him to heaven. If saints are there, they can even take us to the path of liberation. In Ramayan, the character of Sugreev is an example of this. Sugreev’s fortune was that he trusted Hanumanji (his Guru and guide) more than his own mind. Hanumanji, not only introduced Sugreev to Bhagwan Ram, but made Bhagwan Ram friend of Sugreev. And throughout life, Hanumanji made sure that Sugreev is close of Bhagwan Ram and therefore Sugreev attained the highest goal of life. One should attain a lot of dharma by doing charity, by helping and serving others, and by refraining from sins. World is meant to do a lot of dharma and one should attain righteous values as much as possible so that his next births, and even this birth, are better. One should make the Lord happy. With God’s happiness, everything becomes possible in life. God was so happy on the jeeva called Parikshit that He gave darshan to Parikshit in the womb itself. 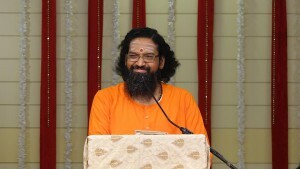 The last thing to be attained is for a higher class of seeker – Moksha. Do something so that you don’t have to be reborn again. Birth brings a lot of problems. If we are told to relive this birth, we won’t want to relive it. We should attain Bhakti (devotion) and Vairagya (dispassion) in life and not just remain satisfied by attaining wealth, family and fame. One should be clear what he should attain in life, and if he is not clear then he should do punya (merits) to get saints in his life. You don’t get saints so easily. To get a saint who loves you, guides you, who holds you finger and tells you where to move, is not easy, and therefore one should have a lot of punya. The glory of saints is that they love God a lot and only because of that they are happy without anything. Biggest fortune in life is that we should love God. Those who have got the joy of listening to Bhagwan’s glories, they don’t want any other joy in this world. As Ramji, Sitaji and Lakshmanji walked through the forests, Sitaji walked such that Ramji was ahead of Her and she was careful not to stamp the footprints of Ramji. This way of walking of Sitaji has profound significance. This symbolises that we must not transgress God. There are some rules of the Lord and some desires of the Lord for us. While walking through the world, God should be the one who is in front of us and not our vasnas. We must not do anything only because we like it but we must do only those things which are liked by the Lord. In life, a lot of sacrifice is demanded. Our disturbance is nothing but our inability to sacrifice or give-up something. 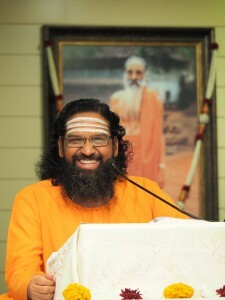 Secret of living is this much only – don’t follow your small self, follow your Lord, follow your Antaryami, follow your Guru. If you go ahead of Lord and Guru, world will kick you. Lakshmanji walked such that Ramji and Sitaji both were ahead of him and towards his right. Lakshmanji, being careful not to stamp on the footprints of Sitaji, signifies that we must not walk behind Maya. Sitaji here represents ‘Maya’. Instead of walking behind Maya we must see the Maya (or the world) as belonging to the Lord and then be in the world. Don’t cross the limits of Maya and God. Being in the world is not a problem, problem is that while in the world, we miss to perceive the God in it. Wherever we bring God in our life, our problems get solved and wherever we take Him out, our problems magnify. If God has given money, money should be given back to Him alone in some manner. If God has given youthfulness, youthfulness should be utilized only for God, not for ourselves. Nobody gets only conducive situations in life. The art of making bitter things sweet is the art of living. This is called seeing the world with the eyes of God. Keep seeing the footprints of the Lord. The acceptability towards situations come when you see Lord as your lover; for one never questions but simply accepts a true lover! After visiting the ashram of Bharadwajji, Bhagwan Ram went to the ashram of Valmikiji. By visiting various ashrams, Bhagwan Ram is giving a message that ashrams should be an integral part of our life. 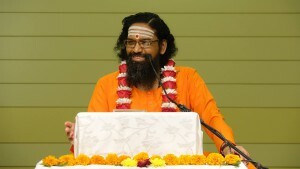 It is so because satsang is held there and satsang alone gives right direction to life. Life of saints is a living testimony that a simple loin cloth clad body can house a contented soul. Scriptures have said that the joy of the biggest king of the heaven and the joy of the Indra too is smaller than the joy of a Gyani saint. Such is the glory of saints! In Bhagwat, it is said that like the external sun gives light, similarly the saints give us light to see the situations as they actually are. They give us the courage and faith to face difficulties in life. They alone connect us to God. Seeing the saints we realize that God exists. Others may cheat us and lie to us, but saints can’t lie. Saints only say the right thing. They make us fearless. They give us knowledge. They tell us that we can live without desires too. They tell us that all joy is with God alone and we don’t need any worldly person or thing to give us happiness. Saints think about your ultimate good; they think that you should not be reborn. Saints think that you should have an immaculate character. Saints think that before you leave the body, you should know the Self. Saints are the manifestation of God alone. We all need lot of direction in life. We all need lot of encouragement in life. We need to be patted sometimes. We need somebody to ask us if we did japa, path and sadhana. Saints do the praan-pratishtha of Bhagwan in our heart. They bring ‘live God’ in our heart; that God which talks, that God which scolds, laughs, and cries. 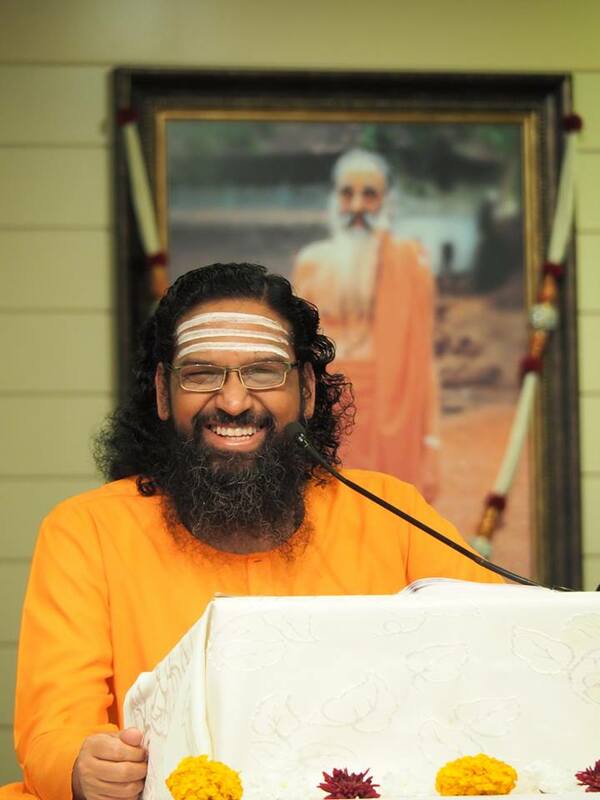 Center of our life should be a saint (Guru) only, because of whom we smile, we laugh and we work. Saints tell us what is the glory of Lord’s name. They tell what is the glory of puja, japa, and what is the glory of calling God. They alone can bring God in our life. Without the Guru, God doesn’t come in our life. We should go to saints, sit at their feet and ask beautiful questions if they permit. We should offer our humility to them. Bhagwan Ram gave so much honor to the saints. He showed that we are always smaller than the saints and we should always offer our love and respect to them. Saints are rightfully highly honored in India and hold a high stature. There is a rule that if a saint comes in the house, he shouldn’t go hungry because he is the moving temple of God. A saint has done a lot of puja and upasana; he has propitiated God for years together. He has chanted Lord’s name and has done upasana of his own Guru. He has prostrated to God innumerable times. Glory of saints is infinite. If they want, it will rain; if they don’t want, clouds will disperse. One person went to Udia baba and said, “I have four daughters and none of them are getting married.” Baba saw and said, “Within one year all will get married.” Four boys came from four directions and all got married in the same mandap on the same day. Power of saints is immense. They have a lot of sankalp shakti. The joy of living with a saint is to melt his heart. We all want love, compassion, knowledge, and so we should melt the saint’s heart and milk everything out. If we don’t then we ourselves will be deprived. One who has ahankaar (ego) he doesn’t get the benefit of living with the saint. One who is humble, he gets the benefit because he gets a lot. Ramji led a ‘sankalp shoonya’ life i.e., not a single action He did as per His own want or His own sankalp. When we follow the will of someone higher in life, God operates through us and when we follow our own will, God removes Himself from our lives. More we tune ourselves with the cosmic will, more we will be powerful in our lives, more we will feel stronger. People suffer because they do what they want and not what God wants. If we do what God wants, our sufferings will become enjoyment. If our will is not happening then it is the God’s will that is happening, and so we must be happy that God is winning in our life. Our life should be such that we become an instrument of a saint or Guru or Bhagwan. Such a person alone leads a free and quiet life! Valmikiji says to Bhagwan Ram, “You are the one who makes everyone dance.” We all are being made to dance as per Lord’s will. If we ananlyse our lives carefully we will realize that somebody else is the bigger player. We will agree that whatever best has happened in our lives, we have done minimum to achieve it. This thus signifies that there is nothing to be desperate about. Lord can work wonders; we just have to be a part of His planning. More we realize this, more we will be quiet. We must try to hold-on to His hand which is making us dance. In life learn to accept what cannot be changed. To dance the way Lord wants us to dance, is our glory! On the concluding day of the monthly yagna, Swami Abhedananda explained how surrender and love for the Lord is the true source of quietness and happiness in life. 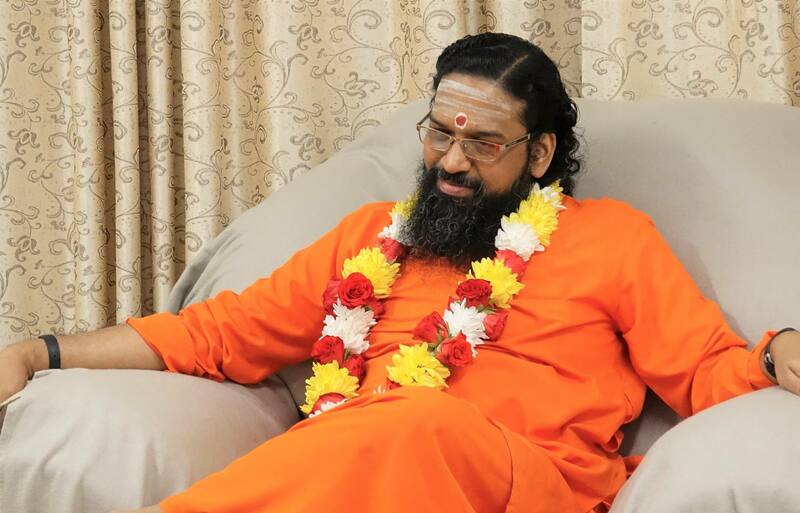 Also, taking examples of the great characters from Ramayana, Swamiji explained at length on the quintessential qualities of a devotee – humble, selfless and ever ready to serve! Valmikiji says to Bhagwan, “World is seen and You are the seer, and everybody is dancing to Your tune.” We all are puppets in the hands of the Lord. One Mahatma used to say – Never wrestle with Lord. That alone will happen what He wills. Say to the Lord, “I already accept my defeat. Whatever is Your wish, You do that, I will accept it.” More freedom we give to Lord, more we will be quieter. Many things in life will happen which you may not like. The devotion aspect in you will make you accept all such things. If we know this fact that we are all puppets, we are just doing whatever He likes, and we have lesser choices in life, then we remain quiet. Valmikiji also adds that only that person knows the God to whom God reveals Himself. About Bhagwan, only Bhagwan can tell; and the one who knows Him becomes Brahman! Continuing his praise for Bhagwan, Valmikiji says, “You are like chandan (sandalwood paste); You cool the heart of the devotees by Your grace.” Without the kripa of God, we would never be aware of His glory and that He alone is the biggest need of our life. Those who love God, they alone know Him well. Lesser is our love, lesser is the knowledge. Love is the greatest Guru. Love can make you know everything. When Bhagwan Ram went to Chitrakoot, all the devatas came and welcomed Him. Bhagwan Ram offered His pranaams to the devatas. Bhagwan Ram was always the first one to greet others. We too must learn that even if we don’t like someone or don’t get any reply, then also we should be the first one to greet…as its not the person but the God inside that person whom we are greeting. World demands and rewards selflessness from us. Anybody is happy because he is giving more than what he is taking. And anybody is sad because he is taking more than what he is giving. One who is giving, he alone is lovable! Give lot of love, lot of respect, lot of honor to others, and your life will be full of joy. Sad people are those people who have not given sufficiently. Sadness doesn’t come from external situations but from refusing to acknowledge that God has given us a lot. When the tribal people of Chitrakoot came to meet Bhagwan, they brought fruits and bulbs in their leaf-cups. They had tears in their eyes as they gazed at the Lord. They were devotees of the Lord. After having darshan of the Lord they felt that all the birds, animals, tree etc. of Chitrakoot were the most fortunate. Bhagwan Ram too met these tribals with extreme love. Bhagwan Ram loved everybody. The bigness of a big person is that He leaves His bigness in front of a smaller person. Those who have no ahankaar, they alone become one with everybody. When we love God, it is only then we try to find out how to give Him joy. The tribal people tried to serve the Lord through various means, by removing pebbles around His feet, making a cushion of leaves and flowers for the Lord, making His bed of soft grass etc. Loving is not an easy thing. It is easy to have a big intellect but very difficult to have a big heart. Lakshmanji served Bhagwam Ram and Mother Sita day and night. Even before Bhagwan could ask anything, Lakshmanji had it ready. Joy of giving seva is more than joy of taking seva. Joy of a servant is that his master is very happy with him. Even in the dream Lakshmanji never remembered his wife and mother; he was so focused in his seva towards Bhagwan Ram. A beautiful analogy said about Lakshmanji is – as the foolish person serves his body, Lakshmanji serves Bhagwan Ram. To serve is very difficult. We cannot be moody, lazy, angry or unnecessarily emotional while serving. To serve, one should have a lot of patience. One can serve even by his smile, his eyes, and even by his body language. Sitaji too served the Lord day and night never remembering Her house and family. Sitaji was more delicate than Bhagwan Ram. Many a times thorns, pebbles used to prick Her feet but she never reacted. The love of Sitaji was so much that the forest appeared to Her as thousands of Ayodhyas, the cottage appeared like a palace, the bulbs and fruits appeared like delicious food and the mat on which She slept appeared like a nice bed. If we want to have comfort we cannot serve. To serve we have to be ready to go through any austerity. Serving is having the thirst that, ‘I want to give my master a lot of joy irrespective of the pains that I have to go through for it.’ No serving is possible unless there is some pain involved. To give joy one should be free from the desire of having ‘personal’ joy. Only those who don’t care for their own comfort can serve a lot!